As the profession becomes more prominent, opportunities abound for young and old alike. In fewer than 50 years, the field of health informatics has become enmeshed so tightly into the fabric of health care's transformation to value-based care that demand for experienced professionals will continue to skyrocket for at least the next decade. That's according to a recent survey by Bisk Education and the University of South Florida (USF) Morsani College of Medicine, undertaken in partnership with HIMSS. Those findings track with earlier predictions, including a 2014 research report from Burning Glass Technologies that projected demand for health informatics professionals would grow at twice the rate of overall employment. Additionally, the US Bureau of Labor Statistics projected the number of health informaticists to grow 15% by 2024, which is faster than the projected job growth of all other US professions, lending to CareerBuilder.com's decision to designate the profession as the top job opportunity in an emerging industry. "The core of health informatics is about putting the right information in front of the right person at the right time in the right format to help them make decisions. The direction of the field is shifting rapidly. Now that we are approaching a critical mass of health care organizations with at least basic health information technology, we can start looking at different questions," says Kim Unertl, PhD, MS, an assistant professor in Vanderbilt University School of Medicine's department of biomedical informatics. "We need to move toward more meaningful health information exchange and thinking about how to link health informatics more closely to public health. Areas like the Precision Medicine Initiative and the broad area of data analytics are also going to continue expanding the field. Health informatics has a role to play in homes, schools, and communities that we haven't fully explored yet, and that's another area where I can see continued expansion." Though considered by many to be part of HIT or even HIM, health informatics is actually the science behind HIT and the application of informatics concepts, theories, and practices to the achievement of better health outcomes. Its massive growth over the past few years has been driven largely by the accelerated adoption of EHRs and the rise of data-driven initiatives such as value-based care and population health. "The field will expand, without a doubt," says Steven Ton, MS, an instructor and the internship director in the department of health management and information at the University of Central Florida's College of Health and Public Affairs. "As we graduate from adoption and implementation stages to improved outcomes, continued compliance, and return on investment, the field must also move with it. The implementation demands today will soon be shadowed by the demand for actionable information and business intelligence. This is already happening with our progressive health organizations. Health informatics will need to expand to include greater competencies in areas of data analysis and mining, and perhaps even predictive modeling." In the Bisk/USF survey, which examined everything from salaries and job types to overall job satisfaction, respondents shared Ton's optimism about their career path. Only 41 out of the more than 400 participants did not foresee career growth over the next five years, compared with 337 who expected opportunities to expand. The profession also offers stability, with more than 100 respondents indicating more than 10 years of experience in health informatics and 160 reporting they've worked in the field for six to 10 years. Furthermore, 140 respondents said they were very satisfied with their careers, compared with just 18 who indicated they were very dissatisfied. The researchers also noted "a correlation between level of education and job satisfaction. Respondents with advanced degrees (master's and doctorate degrees) were more likely to be very satisfied (89 people) or at least somewhat satisfied (55 people) with their career choice as compared with people who are very dissatisfied (only four people)." That may be the result of the higher salaries netted by those with credentials or advanced degrees. The USF/Bisk survey found that additional credentials such as certifications roughly doubled the chances of professionals earning an annual salary greater than $130,000—a level reported by just 28 respondents (12%) without credentials. Education, location, years of experience, and job description/title all influenced compensation, with the majority of respondents earning more than $80,000 annually. It's interesting to note that, in a divergence from other health care sectors, women appear to be leading the way in health informatics. Not only did 232 female respondents report having additional credentials compared with 150 men, but women also made up 54% of the overall participants. Despite the gender breakdown of the survey respondents, signals are mixed when it comes to women in the field of health informatics. Many professionals came over from HIM, which is traditionally a female-dominated profession. However, many also came from the sciences and technology, which tend to feature more males. As a result, there aren't many women who have reached the level of chief medical information officer. However, according to Melissa Saul, director of the Analytics Center at the University of Pittsburgh department of medicine and an adjunct assistant professor in HIM, an influx of PhDs moving into translational informatics, personalized medicine, genomics, and other similar areas are bringing more women into the profession. "You have to understand the domain," she says. "It's not just about the process. It's about figuring out what we have to do and how to get it done. Informatics figures out what data we have to track, such as the sequencing information of a patient, so it doesn't get done again in another health care setting. [It's] figuring out what we need to do to deliver better care for our patients and how to provide this service to remain competitive within the marketplace. Informaticists figure out how to create new frameworks to support the organizations and transfer the operation to HIT. Ultimately, we want to be able to use informatics to enable us to have the best care for our patients." The challenge is not a glass ceiling, however. "I don't see a lot of people saying, 'She can't do it because she's a woman.' Rather, there are usually fewer women involved in these projects," Saul says. One deterrent is the historically low number of women pursuing science, technology, engineering, and mathematics (known as STEM) education, a trend that is slowly reversing as more emphasis is placed on encouraging girls to explore these subjects earlier in their education. As a result, "more women are getting trained in the sciences," Saul says. "They aren't just limiting themselves to the HIM curriculum. We now offer classes in genomics, and we are teaching more of the science-oriented classes. We're bringing more translational science into the HIM curriculum than we did before. "Before, we also taught survey courses in technology, [and] now we have database design and analysis courses," she continues. "Concepts learned in these classes can help with informatics projects because HIM professionals will now have a background in technology and analytics." Now, Saul sees a 60:40 ratio of women to men in the graduate-level informatics courses she teaches. As they graduate with advanced degrees, these women will be better positioned to compete for high-level positions. "Because there are more women in the program, they will have a different role than they have had before," she says, cautioning that "while there are opportunities, there just aren't as many. [A hospital] only needs one director, so [women] will need to figure out other places in the health care sector" to put their advanced informatics training to work. Informatics is "absolutely critical in transforming the health care delivery system," according to Deborah Kohn, principal of Dak Systems Consulting. As such, it has "absolutely opened up a marvelous opportunity for anyone who has the desire to manipulate data for research and reporting." However, she says education and training must continue to evolve within the profession to ensure the next generation of health informaticists can keep pace with the increasing demands health care is placing on the massive volume of data it is collecting. "Since I believe strongly that informatics is the way to go, that we need to mine the data we are now able to collect digitally, [health care professionals must] hone their skills in statistics, regression analysis, and all those disciplines that are so important for research and for outcomes and reporting," Kohn says. She is not alone in her thinking. Ton notes that health informatics programs are well-positioned to keep producing qualified professionals to meet the needs of today's workforce, but only if they can evolve in tandem with the industry's changing needs. And while desired education and experience varies by employer and care environment, there is a core set of qualities most organizations seek in new informaticists. "Strong verbal and written communication skills, a foundational understanding of the health care landscape, a strong work ethic, and a desire and aptitude to learn new skills, systems, and methodologies," are all highly desired, he says, adding that specific roles will have specific qualifications. For example, graduates working with health data analytics teams should have proficiency in biostatistics and dashboard creation, as well as experience with business intelligence tools. Advanced certifications also can help prospects stand out from the crowd. Among those that Ton recommends new graduates consider pursuing are CPHIMS, RHIT, and CHTS, which are offered by HIMSS and AMIA. "Having these additional credentials helps further substantiate the candidate's qualifications and helps get their résumés picked by automated systems and hiring managers," he says, adding that opportunities are plentiful at both health systems and vendor organizations. "And [don't] forget that health informaticists are experts with data analysis and therefore find opportunities in evaluating postimplementation performance. Although prospects are good, the candidacy pool includes many experienced professionals as well, therefore creating tough competition. New grads willing to travel or accept more entry-level positions as a way to break into the industry will find a wealth of job opportunities." Preparation for a career in health informatics can begin as early as high school, helped in part by the AMIA High School Scholars Program. Launched in 2014, the program's primary goal is to provide dissemination opportunities for high school students engaged in biomedical informatics research. Unertl, who helps run the program with JT Finnell of the Regenstrief Institute and Neil Sarkar of Brown University, notes that students are becoming aware of biomedical and health informatics much earlier than in the past, and that the idea of applying computer science skills to important problems in health care appeals to many. "Looking back 10 to 15 years ago, many informatics training programs focused primarily on graduate and postgraduate levels," she says. "Informatics training has rapidly expanded since then to community colleges, undergraduate programs, certificate programs, and outreach to high school students. All of these different types of educational opportunities are helping to expose more students to health informatics as a potential career area, which is great for both the students and for the field." The AMIA effort is starting to explore how to introduce informatics to even younger students via computer science initiatives such as President Obama's Computer Science for All program. With financial support from the National Library of Medicine, Vanderbilt offers a summer internship program for undergraduates and high school students. What they have found is that when students are introduced to the concept of informatics early, they tend to build lasting connections. "If these kinds of programs to get all kids involved in some kind of computational thinking keep expanding, the field can clearly benefit. The question is what kind of role, if any, we can or should play in helping to shape these programs. I can see health care applications of computer science as an interesting sandbox for kids of all ages," says Unertl, who was herself inspired to pursue the field after an undergraduate degree in biomedical engineering landed her in a variety of roles with a laboratory equipment manufacturer. "I had the chance to see firsthand how important it is for doctors to have the right information at the right time to be the most helpful to their patients," she says. "It inspired me to look into computer science fields that deal with health information." While most of the focus within health informatics is on the sciences, "we also need people with backgrounds in organizational and social sciences," Unertl says. It's also important to continue to work to attract greater diversity to the health informatics profession. "We have challenges related to underrepresentation of women and minorities in health informatics. This is both a pipeline problem and a career path problem," Unertl says. "This is one of the reasons why I feel so strongly about high school programs. If we can reach students when they're making decisions like 'Should I take a programming class in high school?' and 'What college majors should I think about?' and show them what kinds of work they can do in health informatics, we can begin addressing the pipeline issue even earlier." The Veterans Health Administration (VHA), which was among the earliest adopters of EHR technology, played a key role in the rise of health informatics. The nation's largest integrated delivery system had to get creative about developing resources to support the software and subsequent upgrades. One idea was to turn to the very clinicians who were using the programs. "That legacy is really apparent in the workforce surveys we've done with the VA informatics staff," says Molly Manion, MSN, RN-BC, CPHIMS, a nursing informatics specialist in the VHA's Office of Informatics and Analytics. "There is a lot of diversity in the job roles people have who support EHRs … including clinicians and nonclinicians on up to very specialized roles and those academic types with advanced degrees in informatics." Today, the VHA has approximately 6,000 individuals working in informatics across its 152 medical centers. 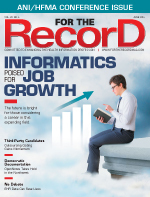 It's difficult to be precise about the number of informatics professionals because there is no job classification within the federal system assigned specifically to the field. Manion believes this oversight may be contributing to the lack of career path clarity the agency has identified in the three informatics workforce surveys it has completed since the introduction of a secretary-level initiative to transform health care across the VHA through the use of informatics. The surveys, conducted in 2011, 2013, and 2015, consistently identified confusion about the various job descriptions and titles, which at the VHA range from nonclinical health informatics specialist and chief of health informatics to clinical applications support such as bar code medication administration coordinator. In all, Manion's team has identified 22 different titles that fall under the informatics umbrella. "It's something we are working on with [human resources] in response to the findings, establishing standardized position descriptions for people doing this type of work," she says. The lack of a clearly defined progression hasn't slowed demand for or interest in the rapidly expanding roles informatics professionals play in the VHA—or the need to continuously enhance the health informatics workforce's skill sets to keep pace with HIT and data utilization. To avoid a talent shortage, the VA's Health Informatics Workforce Development Team created career paths and competencies, and helped build communities to help those interested in the profession develop the necessary skills and networking capabilities. "There are a lot of opportunities in the VA for people to enter this field and engage in on-the-job-training," Manion says. "We are putting together formal training programs that cement their foundational knowledge about informatics and informatics methods. It's a multifaceted approach to educating this workforce." These programs include an online introductory course in health informatics developed in partnership with Bellevue College in Washington state, a member of the Office of the National Coordinator for Health Information Technology Community College Consortium. The agency also partnered with AMIA to develop the VA Health Informatics Certificate Program (AMIA 10x10), an intensive six-month online program designed to educate and empower informatics leaders who implement and support HIT efforts within the VA.
"We enroll 250 to 350 students every month. There doesn't seem to be any plug to this bucket. Each month, these programs are full or almost full," says Diane Bedecarré, MS, RN-BC, CPHIMS, a workforce development colead. "There are a lot of opportunities to get trained and to contribute and they are increasing as we modernize our systems. There is more of a need for an educated and engaged workforce as those new systems get deployed, [so] we've tried to promote the idea of people getting specialty certifications and have sponsored several prep courses." Also available is a graduate-level lecture series based on AMIA's core curriculum for clinical informatics. The VA has provided nearly 2,000 live training broadcasts on health informatics topics via its eHealth University. Career resources are not limited to VHA employees. The agency offers training to military staff to develop the skills needed to enter the field after they leave active duty. "There is just a huge need in the VA for people who can manage and analyze data. We are now working with Bellevue on a Health Care Data Analytics course which we believe will be just as popular," Bedecarré says.